On the bus from York station to the University I fell into conversation with another member. She wondered if I was hoping to come back to the new Synod in November. Business-wise, as predicted, it’s been a bit of a rag-bag – with some gems hidden in it. Or, if you prefer, a pot-pourri with some interesting notes. 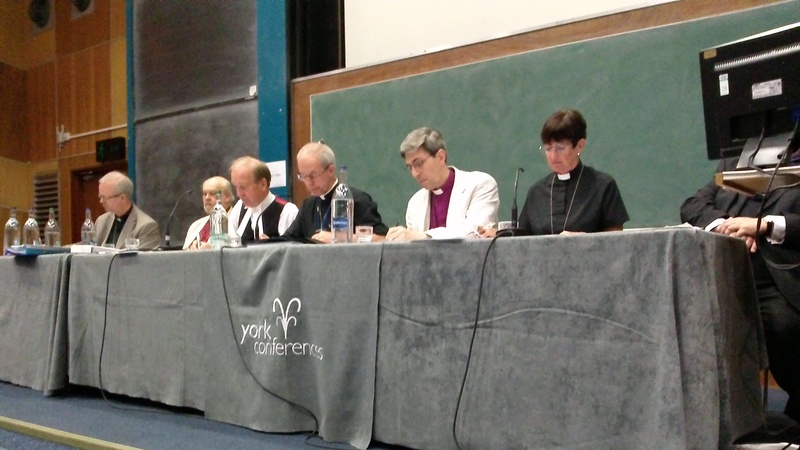 The clergy Convocations met separately (i.e York and Canterbury in different rooms). With brisk chairing by Archbishop Justin, we southerners got through our business in 20 minutes: the York lot took a little longer. We gave warm applause to Christine Hardman, standing down as Prolocutor, and David Houlding, standing down as my fellow pro-Prolocutor. There was a lovely moment at the point where the Upper House (i.e.the Bishops) took their leave and we ordinary clergy in the Lower House carried on without them. It’s part of the Gilbertian aspect of being A Very Ancient Institution. It suddenly occurred to me that this was the last time in the (?) 700 years of the Convocations that the Upper House would consist entirely of men. The next time we meet into this way, Rachel Treweek will be in post as Bishop of Gloucester. So it was a little historic moment. 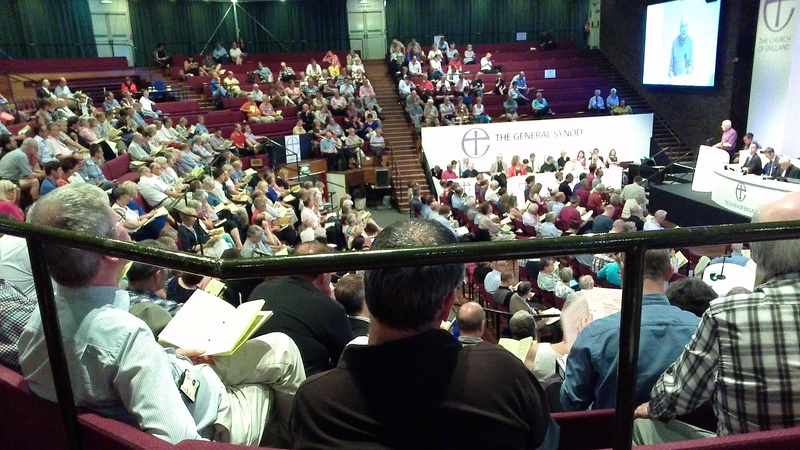 Once we got to Synod proper, Archbishop Sentamu began his Presidential Address brilliantly, with an absorbing and terrifying account – some of it first-hand – of the effect on him of the martyrdom of Archbishop Janani Luwum in his home country of Uganda. However, he lost the attention of some (despite helpful Powerpoint slides) when he went into a bit of a Bible study, which didn’t quite match the impact of his testimony. He also over-ran, which meant the Debate on the Agenda was squeezed. 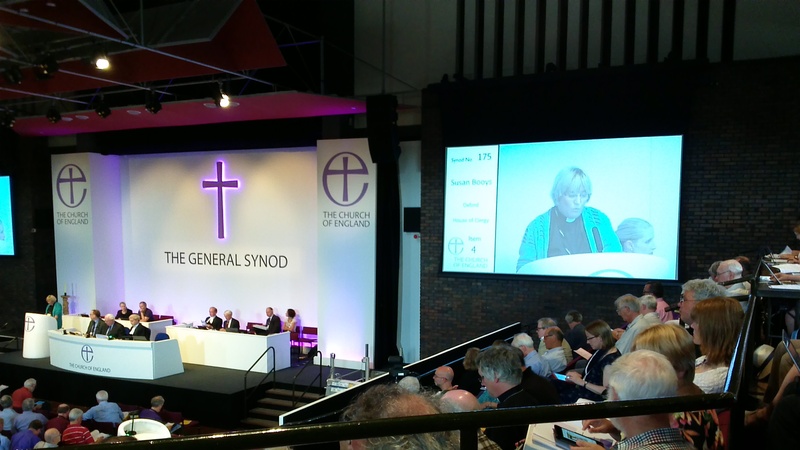 Canon Sue Booys took us speedily through the agenda, with a glance at the changes in Synod that have occurred in the last five years. It is a rather different place, both cosmetically (we have an updated ‘Starship Enterprise’ stage set) and in terms of the way business is planned and done. She dropped the hint that in the next Quinquennium, we might see more changes, largely thanks to electronics. After supper, there was a lot of tension around Questions, particularly with the new format. First up was John Spence, the current ‘go-to’ man on finance and ‘Reform and Renewal’. He is a brilliant stand-up comedian, and there was some nifty ‘business’ between him and the Chair about how long his answers might be. It was worthy of Morecambe And Wise, John playing on his age, and the Chair, Aidan Hargreaves-Smith making much of his (supposed) youth. Two Bishops had pretty hard questioning about aspects of Green and ‘Reform and Renewal’. The Bishop of Coventry struggled a bit under hostile supplementaries (“Is that a ‘no’? asked one combative lay person, leaving the Bishop struggling.) 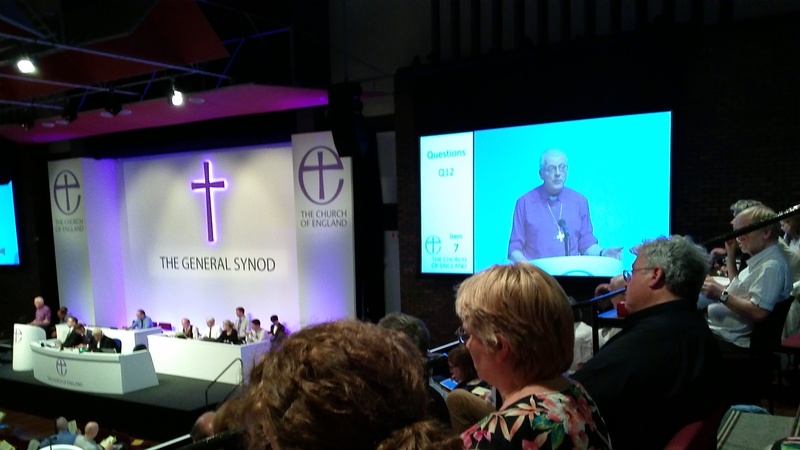 The Bishop of Truro had similarly pressing questions, but handled them with humour and self-deprecation – including a straight ‘No’ at one point, which we all enjoyed. To be fair to them, they were standing on for the Bishop of Ely, who is ill. The ‘Learning Community’ is clearly Synod code for those clerics being put forward for intensive work to prepare them for senior leadership. In Fleet Street it’s referred to as the ‘talent pipeline’, and we learned tonight that it is 77% male, 91% white and the average age 44. Or as John Bingham of the Telegraph puts it ‘male, pale, and stale’. Male and pale, yes, but I suspect those selected are certainly not stale. However, the whole thing is clearly regarded with suspicion by Synod, who were very bothered about the ‘secrecy’ of it (a point demolished fairly well by the Bishops). After the fun and fireworks (remember: you heard it prophesied here first ..), Questions got ever so slightly dull, though the issues are important. 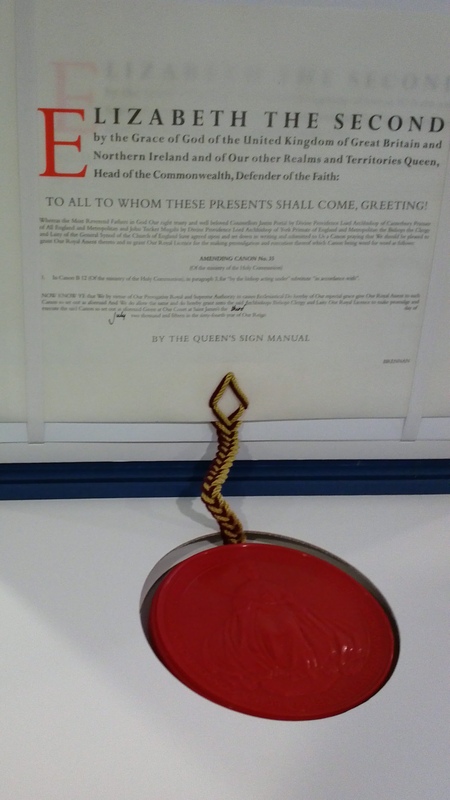 However, one fact came through that ought to interest Fleet Street and the Church press: there is clear concern at Church House about the effect of the Budget on clergy households. Reform of Tax Credits will affect many clergy families, for example. Philip Fletcher, answering on behalf of the Mission and Public Affairs team did not go into detail, but the Bishop of Manchester made a point of mentioning it. Overall, lots of light and a fair bit of heat was generated by the new Questions. We saw Bishops and Archbishops discomfited by sharp questioning; we threw light on Church House allowing arms companies to sponsor alcohol and sandwiches, and we heard some fairly unconvincing Answers as to why the Church Commissioners are the only Church of England body to retain the old ‘Pastoral Committee’ title (everyone else has ‘Mission and Pastoral’ Committees. And (as predicted here) there was severe discomfort about the Green Report and various aspects of ‘Reform and Renewal’. As well as asking each other when we might meet again, the subterranean topic of conversation is the Church’s approach to human sexuality. There are a couple of fringe meetings planned to look at this (from different perspectives), and I was privileged to hear some fairly frank conversation about how we will handle ‘the gay issue’ in a late-night bar session. Achieving ‘good disagreement’ when people are trying to handle Scripture, pastoral concerns and plain old human nature will be the big issue for the next quinquennium, I imagine. This entry was posted in General Synod and tagged Archbishop Sentamu, Church of England, General Synod, Green report, John Bingham. Bookmark the permalink.